"In total, Florida's economy will gain an additional 700,000 jobs, $74 billion in state GDP, $41 billion in higher personal income, $1 billion in total state tax revenues as a direct result of the increased economic growth." By Amy Sherman on Monday, November 26th, 2018 at 3:36 p.m.
Gov. 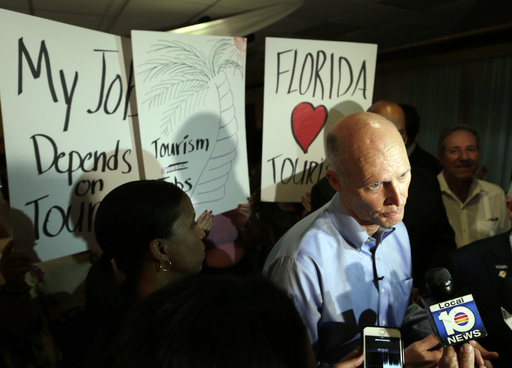 Rick Scott's 7-7-7 plan promised to boost Florida's economy and wealth in several ways. "In total, Florida's economy will gain an additional 700,000 jobs, $74 billion in state GDP, $41 billion in higher personal income, $1 billion in total state tax revenues as a direct result of the increased economic growth," Scott promised when he first ran for governor in 2010. As he nears the end of his two terms, we wanted to examine the state's performance on each component. "Gain an additional 700,000 jobs"
We gave Scott a Promise Kept for his pledge to create 700,000 jobs on top of the 1 million jobs that would already be created in seven years. Florida had added 1.49 million nonfarm jobs between the end of December 2010 and February 2018. If we look at the most recent data through October, the state added more than 1.6 million nonfarm jobs during Scott's two terms. "$74 billion in state GDP"
The broadest measure of the economy is gross domestic product, or the total value of goods and services Florida produces. In 2010, before Scott took office, Florida's GDP in inflation-adjusted dollars was about $766 billion. It rose to about $883 billion by 2017, the last full year for which data is currently available from the federal Bureau of Economic Analysis. That's an increase of $117 billion, well in excess of his promised $74 billion. The growth is less impressive in terms of GDP as a percentage of the economy. In percentage terms, Florida's GDP growth "translates to 1.16 percent per year for eight years, which is very weak," said William Seyfried, Rollins College economics professor. Seyfried found Florida's economy took longer to come out of the recession than the nation as a whole. But in some recent years, Florida's economy outperformed the nation. "$41 billion in higher personal income"
Personal income has increased dramatically during Scott's tenure, according to federal statistics. This measure is all income collectively received by all individuals or households, and includes wages, salaries, investments, and bonuses. In 2010, personal income totaled $725 billion. In 2017, it hit $1 trillion. That's an increase of about $275 billion, far above Scott's promise. "Comparing Florida to the U.S., personal income in Florida grew faster than the nation since 2013 after underperforming between 2010-13," Seyfried said. "$1 billion in total state tax revenues"
There are many ways to look at state tax collections to include collections from fees, trust funds and more in addition to taxes from everyday commerce and assessments. We're going to use the federal measure, which shows that state government tax collections grew from about $30.5 billion in 2010 to $37.2 billion in 2015. Again, the growth is far above what Scott promised. He earns a Promise Kept. By Joshua Gillin on Thursday, September 4th, 2014 at 3:29 p.m.
Gov. Rick Scott's 7-7-7 plan to grow Florida's economy has been marching steadily forward the past four years now, but it appears some facets of the plan have just about been achieved -- depending on how you measure the progress. While PolitiFact has been tracking Scott's seven-year, seven-step blueprint to create 700,000 jobs, it's important to remember he also promised to increase other indicators of a healthy state economy. While he had said all seven steps of his plan were important to achieving those goals, not all were enacted (for example: the corporate income tax has only been reduced, not eliminated entirely). That hasn't stopped the state from growing, however. We decided it was time to see how those measures stacked up heading into the Nov. 4 election. The most broad measure of the economy is GDP, or the total value of goods and services Florida produces. The U.S. Bureau of Economic Analysis measures this two ways: nominal GDP and real GDP. What's the difference? Nominal GDP gives the measure in an actual dollar figure, while real GDP adjusts the number for inflation and price increases. That's an important difference, because the numbers are wildly different in the context of Scott's promise. In 2010, Florida's nominal GDP was $728.6 billion, according to BEA. In the first quarter of 2014, the most recent measure to which we have access, it was $800.5 billion. That's a difference of $71.9 billion, very close to Scott's prediction, and with another three years to go. But in terms of real GDP, the increase is much less: from $721 billion in 2010 to $750.5 billion this year, a change of $29.5 billion in adjusted dollars. Scott's campaign used the nominal GDP numbers when PolitiFact Florida asked where the promise stands, of course, and experts told us that's hardly a surprise. "I think it is unlikely that politicians ever make statements about dollar amounts for economic variables using real (i.e., inflation-adjusted) numbers," University of West Florida economist Rick Harper said. "So I think nominal is more defensible." Personal income has increased dramatically in the same time period, according to federal statistics. From the fourth quarter of 2010 to the first quarter of 2014, that indicator shot up $96.7 billion, more than twice what Scott promised. That rise from $738.7 billion to $835.4 billion has a correlation to Scott's jobs promise. We found that as of July 2014, Florida had added 594,900 new jobs since Scott took office. That's less than what the governor's office is counting, 620,300 jobs, because they are only measuring private jobs and not factoring in a drop in government employment. Scott also has backed off campaign trail promises that he would create 700,000 jobs on top of the 1 million jobs analysts had already predicted Florida would add as it climbed out of the Great Recession. Faced with the projections that a million new jobs would become available over five years regardless of who was in the Governor's Mansion, Scott said in 2010 the true result would be 1.7 million, even though there were only about 1 million Floridians out of work at the time. His answer was that more people would move to Florida to fill those new positions. He soon recanted, telling reporters asking about the 1.7 million jobs promise, "I don't know who said that. I have no idea." This portion, too, appears to have been met, although it largely depends on which numbers you use. The promise makes no mention of how this goal was supposed to be measured, and there are many ways to look at state tax collections to include collections from fees, trust funds and more in addition to taxes from everyday commerce and assessments. We're going to use the federal measure, which says tax revenue went up from $30.5 billion in 2010 to $34.6 billion in 2013. That's a spike of $4.1 billion in four years, more than four times what Scott had said would happen. The number could be much lower if we looked at it a different way. Using the fiscal year general revenue numbers from the state's Office of Economic and Demographic Research, the number is more like $3.8 billion, according to state economist Amy Baker, but the figure has gone up either way. There's a question looming over this data: Did Scott mean these numbers would be increases over already projected figures, as he said (and then later denied) about the jobs promise? That's tough to say, and the governor's campaign isn't addressing it. David Denslow, a research economist at the University of Florida's Bureau of Economic and Business Research, said the wording of the plan was important. He noted the plan says the state "will gain an additional" 700,000 jobs, plus these three other promises. It's not specific enough to glean whether that means on their own or on top of projections, which have turned out to be optimistic even as Florida's 2.2 percent growth in 2013 outpaced the United States as a whole, which was performing below initial predictions at a meager 1.8 percent. "By his interpretation, he's applying an insurance policy in case the world fell off a cliff," Denslow said. "(Scott's plan) is saying, you'll still have a powerful governor who will improve things." Whether Scott can take credit for growth that was largely predicted to happen anyway is a matter of politics, according to Sean Snaith, director of the Institute for Economic Competitiveness at the University of Central Florida. "The governor was elected as the state was recovering from the recession," Snaith said. "That didn't hurt." Scott inherited an economic climate that was already on the upswing by 2010, he said, and has benefitted from a steady inflow of new retirees whose investments have recovered and a housing market getting back on its feet. Both of those are always big elements in the state's economy. You'd expect a politician to promote positive changes, Snaith said. "It's like a buffet," he said. " 'All these things were because of me, and all the bad things were the last guy's fault.' "
In addition to adding 700,000 jobs, Scott said his economic plan would grow GDP, personal income and tax revenue by certain margins. These measurements can be looked at in a few different ways, but it certainly seems he's on the right track: Personal income and tax revenue numbers have exceeded his promises and GDP is almost there, assuming the promises weren't on top of growth already projected. The plan is for seven years, so if Scott is re-elected in November he will have plenty of time to reach that final goal. We rate this promise In The Works. By Becky Bowers on Wednesday, January 18th, 2012 at 10:21 a.m.
Not only will his seven-year, seven-step agenda create new jobs, the plan says, it will boost the state's gross domestic product, personal incomes and tax revenues — all as a "direct result" of increased economic growth. We're separately tracking the governor's centerpiece pledge to create jobs. Here, we're looking at whether Scott is meeting the other metrics he set out. We'll be better able to update this part of Scott's promise in June 2012, when BEA updates its statistics. Until then, we can handicap it. University of West Florida economist Rick Harper notes that Florida's GDP in 2010 was produced by an average of 7 million nonfarm workers, for an average output of $104,182. If Scott attains his campaign promise of adding 700,000 jobs at the current average gross state product per worker, that would be an increase of $73 billion, he says — on track to meet the governor's goal of $74 billion. But it's not clear Scott will achieve 700,000 additional new jobs over seven years on top of the million jobs that state economists expected at the time of his promise. Meanwhile, a third of his jobs creation agenda is Stalled. For now, so is this part of Scott's promise. Personal income for Florida in Scott's first quarter in office was $706 billion, according to federal statistics reported in December 2011. Using the same per-worker calculation economist Harper used for the state's gross domestic product, he estimates creation of 700,000 new jobs would yield $69 billion in personal income — beating the governor's projection of $41 billion. That means he might only need to hit 60 percent of his jobs goal to generate $41 billion in personal income. Still, Scott would need to accomplish a hefty portion of his agenda — for example, about half of his 700,000 promised jobs would come from reforms such as eliminating the corporate income tax, which is Stalled. Seyfried, the Rollins College economics professor, points out that key parts of that agenda may not ultimately fall into place. No zeroing out of corporate income tax? That would make it less likely the governor would achieve his jobs goal, and thus other economic growth tied to that hiring. State tax revenues for 2010 were $33 billion, according to federal statistics reported in July 2011. That's 4.2 cents per dollar of the state's gross domestic product that year, according Harper, the UWF economist. So, say the state adds those 700,000 extra jobs, yielding that additional $73 billion in gross domestic product. That would yield tax revenue of $3 billion a year, Harper calculates. That gives Scott a chance to meet his tax revenue goal even if he doesn't fully accomplish his jobs agenda. Just 230,000 new jobs might generate the extra tax dollars the governor promised. For that reason, of the pieces of his promise to boost the economy, this one he's the most likely to keep. During the campaign, Scott clearly explained that his 7-7-7 plan would generate 700,000 jobs on top of expected growth of a million jobs, and that would yield growth in state GDP, personal income, and total state tax revenues. So to accomplish his promise, he's got to implement his full job creation agenda, something it's not clear he'll be able to do. We'll revisit this promise as new data becomes available. But for now, we rate his progress Stalled.